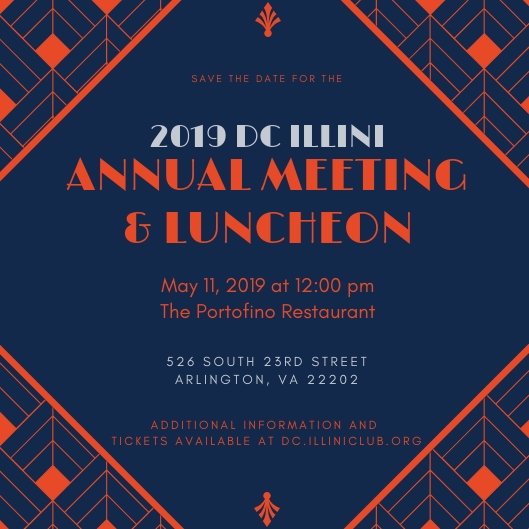 Join fellow and future Illini alumni, including this year's D.C. Illini of the Year and D.C. Illini's 2019 scholarship winners, at this year’s Annual Meeting & Luncheon! When: Saturday, May 11, 2019 Networking will begin at Noon with the meeting program starting at 12:30pm. Tickets: The last day to buy tickets is April 30, 2019!! The price of tickets includes a meal with a salad, entree, dessert, water, tea, soda, and coffee. Attendees can also buy additional beverages at their own cost. Note: You will be asked to select your choose of entree after completing the ticket purchase process. Tickets can be purchsed here. Questions: For more information or for any other luncheon questions, please contact Bob Bevins at bevins_robert@yahoo.com.